Meet Navneet Panda, Who Made Google Panda Algorithm? Who is the Founder of Google Panda Update? 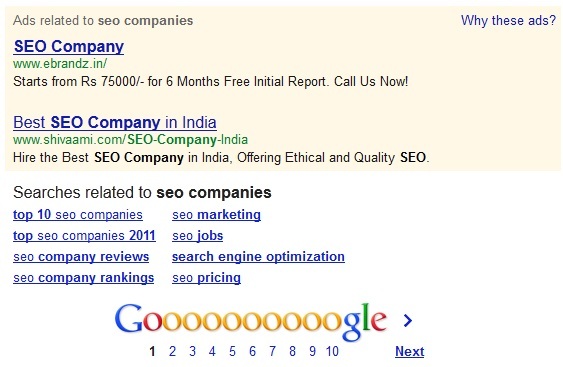 First, Google Panda Algorithm released in February 2011 which was against low quality websites and spam websites. Recently Panda 3.8 updated on 25th June 2012. Firstly, I was thinking it was just a name given by Google for this algorithm. But I researched on it who is the founder of this great algorithm? i.e. 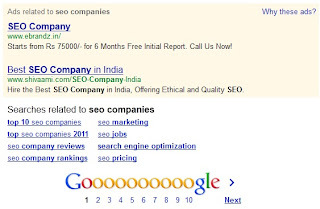 Google Panda Algorithm and I found some useful information related to Panda Update. Google's new Panda machine-learning algorithm, made possible by and named after engineer Navneet Panda, was then used to look for similarities between websites people found to be high quality and low quality. After It, I think there are more options from where I can get information about Navneet Panda i.e. on Facebook, Google Plus and Twitter. I searched Navneet Panda on Facebook, and fortunately I found one profile photo of Navneet Panda and I want to share that photo. 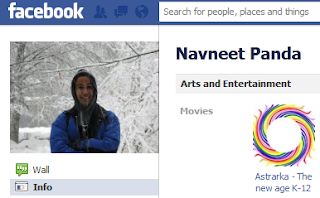 If I found more information about "Navneet Panda" then I will update here. Are you a webmaster? or running any website? The official Tweet of Google on Twitter confirming this Panda 3.8 Update. You can share your experience regarding this update by giving comments! Your comments are valuable for me regarding this Panda Update! Last night, One of my friend ask me on the phone about what is the meaning of this email id free2rhyme@yahoo.com showing on the Yahoo Mail Home Page while Login or Sign Up? I know it was a funny question (because he is newbie to internet and do not about this). I think there may be many newbies who might be do not know the meaning of free2rhyme@yahoo.com If you are new to Yahoo Mail or Internet and do not know about it then you can get the meaning of it from here. 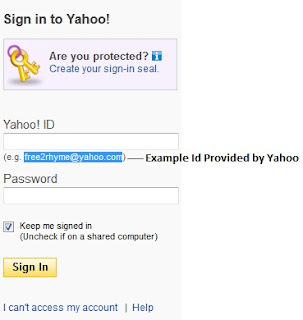 Actually, free2rhyme@yahoo.com is just an example id provided by Yahoo. Yahoo just given this for the example nothing else. 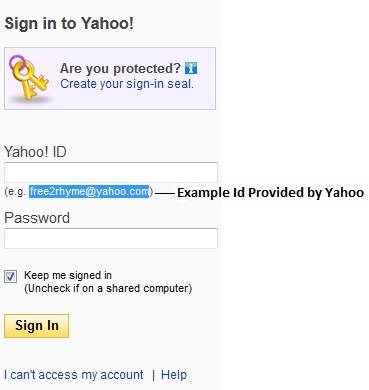 Yahoo want to explain you, that you can also made id some thing like this (It is an example ID) See the image below. How to Use Google Analytics Old Version - Reporting? How to Get Google Analytics Old Version Reporting? Recently, I written a post about Can I Use Google Analytics Old Interface? The answer of this question is "Yes". You can easily use Google Analytics old interface reporting. Actually, You can find old reporting option in Google Analytics at the bottom of the New version of Google Analytics. 3) After Login, you will reach the Google Analytics Account Home. 4) At the bottom of this page you will find the option for "Old version - Reporting" see the image below. Now, you can easily access Google Analytics old interface. 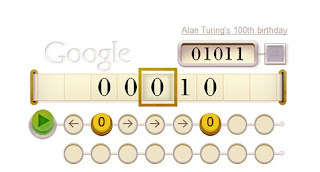 Today, 23rd June is birthday of "Alan Mathison Turing" a great mathematician, logician, cryptanalyst and computer scientist. "Google Doodle" made a very beautiful Doodle related to mathematics and logical reasoning. Alan Mathison Turing, from United Kingdom, nationality British (23 June 1912 – 7 June 1954) and was highly influential in the development of computer science, providing a formalisation of the concepts of "algorithm" and "computation" with the Turing machine, which played a significant role in the creation of the modern computer. Firstly, Google was displaying ads only at the top of the page or at the right hand side of the page (In Google SERP) I think its a good change by Google. Do You Think Displaying Ads Below the Bottom of Page will be Beneficial for Advertiser? I think it might be good for the advertisers. Gone are the days when people always loves to buy Windows XP, Windows XP Service Pack 1, Windows XP Service Pack 2, Windows XP Service Pack 3. Now peoples are always looking for Windows 7. If you are also looking for features of Windows 7 and want to know why Windows 7 is required for your PC?, then here you can find 10 reasons to buy Windows 7 provided by Microsoft. I also recently purchased windows 7 (Home Edition), with my Sony Vaio Laptop. Really Windows 7 is ultimate! Facebook Account Disabled - 5 Reasons - Why Your Personal Facebook Account might be Disabled? Last night, one of my friend told me on phone that his 'Facebook Account' has been disabled and whenever he is trying to access his account, he is getting the following message. I also do not know why Facebook disabled his account because he was using his real name and real info. After this, I investigated the following point. One of Facebook's main priorities is the comfort and safety of our members. Your account was disabled for violating the Facebook Terms. 1) You account must list your real, full name. 2) Impersonating anyone or anything is not allowed. 4) Violation of these guidelines to use a profile (timeline) to represent anything other than yourself (ex: celebrities, pets, ideas, objects). 5) Accounts created for the purpose of spamming or harassing others are strictly prohibited. So, I recommending to all of you, use your real name and real information to prevent your Facebook account. Do you know their is friend limit in facebook profile? Do you know Facebook allowed maximum of 5000 friends for single profile? "Individual Facebook members can connect to a maximum of 5000 friends and Pages. To do this action, you'll need to remove a friend or unlike a Page you're already connected to." Can I Add More Than 5000 Friends in My Profile? Many people want to add more than 5000 friends in their profile and I think Facebook can increase the limit in future If they think An individual member may have more than 5000 friends. Right now you can not add more than 5000 friends in your profile.